I took a break from writing over the past three weeks. I love writing and sharing my thoughts on singing with you, but I also needed the time and the rest to focus on a performance project that culminated on May 24th. Breaks are important. Short or long, they allow you the time to step back and refresh yourself so you can return with better work, ideas, and energy. 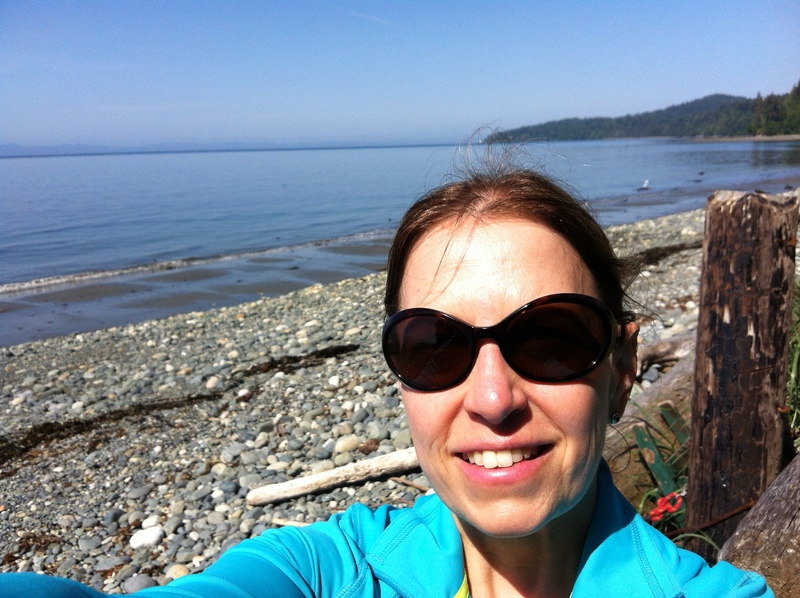 Enjoying a break on the beach near Sooke, BC. My performance project was an opera performance of Mozart’s opera Cosi fan tutte, put on by Fear No Opera, a local company for emerging artists. It was a really fun show with a wonderful cast and production team. We had just one show on May 24th. Many laughs were shared by both the cast and the audience. Putting that much energy into one performance is extremely demanding – the week before the show particularly, is what’s known as ‘production week’. It is an all-consuming, rehearsals nearly every night, week; where the show grows and changes to prepare for the performance. The intensity required for this week is one of the reasons I took a break from writing. When it comes to singing in general, consistent practice is good, but so are breaks. Consistent practice will help you add to your skill sets and open your voice. But breaks are necessary to create space for you to physically and mentally integrate what you have been learning. Athletes don’t train the same way every day, they have rest days built into their training program. Singers should do the same. Vary your own practice; where you practice, how you learn (not all practicing is singing), what you practice, and how you practice. Variety will give your brain the constant stimulation it needs to learn your craft. Breaks will integrate that practice on a deeper level. In the summer of 2010, I participated in a five-week intensive singing program in Austria called the Franz-Schubert Institute. I was singing several hours per day, starting at 8:00 am and often not finishing until 10 pm. I made amazing friends, learned 26 new German lieder, and it took me 6 months to integrate what I learned there into my practice. Immediately after that program, I didn’t sing for 4 weeks. But once I started again and reviewed what I had learned in there, I found that I hadn’t ‘forgotten’ a lot, simply because my body was processing that intensive learning. As we approach the summer months (at least in North America), I encourage you to sing intensively, then take a break. If you normally take 30-minute lessons once a week, take 60 minute lessons for 4 weeks, then take a break. Write down your observations at the end of the intensive period of singing, then return to them after your break. Let me know how it goes for you, or if you’ve taken a break from something and returned to it refreshed, share it in the comments below! 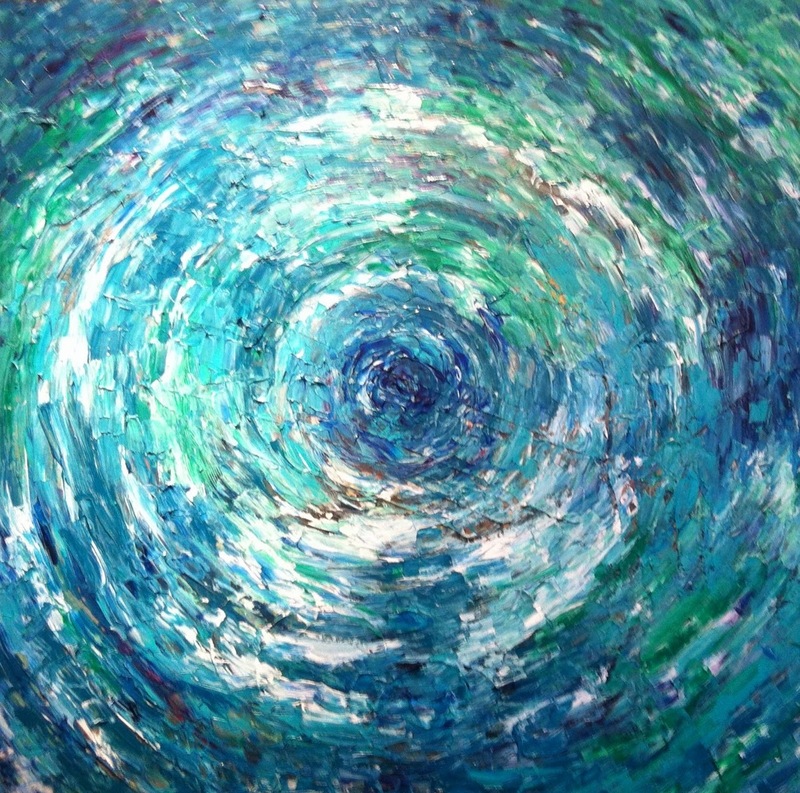 This entry was posted in Music, Singing and tagged ART, brain, breathe, Choir, choral, community, Education, focus, Health, hearing, inspiration, learn, Learning, listening, meditation, Memorization, Music, practice, process, sing, singing, Sound, teach, Vocal, voice on June 5, 2014 by Jen Lang. Learning notes has always been easy for me. I have the proverbial ‘ear for music’. I can follow and pick up a melody, even predict a harmony to a certain extent, with little to no trouble. Uniting music and words together in memorization is what challenges me! 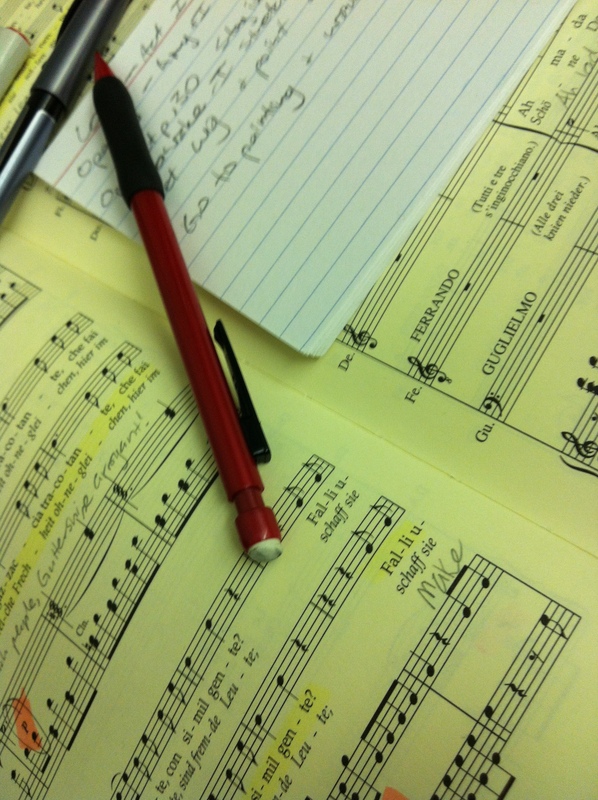 A singer’s best tools: score, pencil, cue cards. Separating text from music gives us a deeper insight into the structure of a piece or song. In most cases, the words existed first in the form of poetry or a libretto (the words of an opera). In an oratorio, the story is usually taken from a religious (Christian) context. When you have experienced German art song (Lieder) spoken as poetry, the true beauty of the language shines through. Poets like Heinrich Heine, Eduard Mörike and Wolfgang Goethe were masters of the written word and inspired multiple composers’ Lieder. I have participated in several programs in Austria where poetry written in German was studied, translated, recited, sung, and performed. It gave me a wonderful insight into the beauty of the words and the environment in which they were written. The next time you are listening to a favorite song – no matter what the genre, find the words and read them out loud to yourself. See if it changes your experience of the song. What was the writer trying to say? Does it change when removed from the music? If you feel inclined to compose, try to set the words to a new melody. As always, I’d love to hear from you. Did you experience words and music any differently after reading this? This entry was posted in inspiration, Music, Singing, Uncategorized and tagged art song, breath, breathe, Choir, community, Courses and Lessons, ear, focus, German, hearing, inspiration, Journals, learn, Learning, lied, Lieder, listening, Memorization, Music, opera, poet, poetry, practice, process, Public speaking, resonance, sing, singing, Sound, teach, teaching, voice, words on May 9, 2014 by Jen Lang. How do you listen? Do you notice or make note of unusual sounds you hear in your day-to-day life? Have you ever thought about how you listen? Have you caught yourself drifting away from active listening? Recently an article from the New York Times on Auditory Sightseeing came to my attention. It got me thinking about how we use our sense of hearing, but also how we disregard some sounds entirely. Go and have a listening experience! How does one have a ‘listening experience’? As humans, we are encouraged to listen to one another in conversation and actively respond to what we’ve heard. As a musician, I like to think that my listening skills are specially developed when compared with someone who didn’t necessarily study music. But even within the genre of musicians, there are groups of people with a specific set of highly developed listening skills. An audio technician will have ears finely tuned to what she or he hears when mixing together different tracks. The conductor of an orchestra will have a highly developed sense of hearing so they can ask for different instruments and colours of sound from the orchestra; in order to create a unique experience for the audience. As a singing performer and teacher of singing, my ears are highly tuned to the human voice and tonality. I can often hear tension in a student’s voice before I see it in their body. What sounds good to them inside their own head may not be optimal singing outside their head! Sometimes a singer will be listening to their own voice so intently that they forget to be ‘in the moment’ of what they are actually singing (I used to do this a lot!). Public speaking is a similar situation – when we’re nervous, we often get trapped into that running dialogue ‘oh, I said that word incorrectly’, or ‘wow, that sounded stupid’, or ‘hey, they laughed at my joke’. This train of thought means you’re listening to yourself too much! If you take your attention to listening inside your own head and away from the message you are trying to communicate, then you are robbing your audience of a fuller experience. Take yourself on a ‘listening tour’ the next time you are out for a walk. Notice different sounds and how they may or may not be pleasant. Notice the rumble of a diesel truck, or some high ‘ping, ping, ping, ping’ sounds as you pass a construction site. Notice the high tonality of birds chirping in the morning. Take note of your neighbourhood sounds and maybe consider starting a ‘sound journal’ – noting the sounds you hear, recording them with your mobile device, or something similar. One last thought – the following short piece was composed based on birds arranged on a set of wires. Music and sound may be found where you least expect it. How did you listen and what did you hear? This entry was posted in Music, Singing, Teaching, Uncategorized and tagged ART, Arts, audition, brain, Choir, choral, ear, Health, hearing, inspiration, Learning, listening, Music, opera, orchestra, practice, Public speaking, resonance, sing, singing, teach, teaching, Vocal, voice, Voice teacher on May 1, 2014 by Jen Lang. What does consistency mean for you? Do you think of food? Do you think of behaviour? How about chemistry? Music? Art? Art work for sale at Intrigue Winery in the BC Okanagan. Sadly, in the original photo I took, the glare made the artist’s name impossible to read. Consistency is one of my Three Words for 2014. I think for me it has been the hardest one to keep present in my mind and in my day-to-day actions. Routine is different from consistency. Routine is your daily schedule that you perform as you move throughout your day. Consistency in that routine is what moves you forward. Incidentally, it also creates good habits! I have started getting up earlier. This consistent action has allowed me to add a few things to my morning routine on a more consistent basis. This includes a short morning meditation, writing this blog, and having time to enjoy my breakfast (most mornings!) before I head to work. Getting up earlier also means I have to go to bed earlier! So, I have tried to be more consistent in the time I end my evenings. I finish up around 9:30 pm and start to get ready for bed. It’s made my earlier mornings much easier and I feel better overall! It’s easy to set a routine or a daily schedule, but harder to stick to it. So by being more consistent, (even on weekends), I find I’m not as frequently overwhelmed by everything I try to accomplish in the day. That doesn’t mean I still don’t try to do too much! Better consistency in my singing practice has also resulted in a more consistent sound and ease in singing. It has been hard to make that part of my routine because although I love singing, I often experience Resistance, that thing we all wrestle with when we have something that needs our attention! By fighting Resistance with consistency in my actions, I lessen the possibility of procrastinating on the things I’d like to achieve. Singing every day, in some way, shape, or form is a consistent action that makes me very happy. What makes you happy? What consistent actions do you do that help you move forward? Leave me a comment below or contact me on any social media – I’d love to hear from you! This entry was posted in inspiration, Music, Singing, Uncategorized and tagged ART, Arts, brain, breath, breathe, change, choice, consistency, Courses and Lessons, focus, habit, habits, happiness, Health, inspiration, learn, Learning, listening, meditation, Music, practice, process, resistance, resonance, sing, singing, Sound, Vocal, voice, Voice teacher on April 24, 2014 by Jen Lang. No, I mean it. Specifically choose to do something small today. You probably already know this, but it’s good to hear it again – It is the small choices you make in your day-to-day life that affect the bigger picture. When I first wrote about choice in my Three Words for 2014, I said that you can choose to take specific actions and then deal with their effects. Choice is an unusual word – it’s a small word with big implications. In a split second, you can choose a path that could potentially affect you for the rest of your life. Do you want the blue pill or the red pill? Alternately, whether or not you have chicken or tofu for dinner isn’t likely to shift the earth! When I was in high school, I remember taking all these ‘career choice’ surveys and finding out where my talents would be best applied in order to lead a ‘responsible and fulfilling’ life. Although they were an interesting personality/interest marker at the time, I certainly did not see myself as being an opera singer and singing teacher in the results of those surveys. In the past year (or so), a friend made an important choice. She left her ‘safe’ day job and struck out on her own to create her own business. Her choices created Sweet Memory Art, so much more than just a jewellery and story collage creating enterprise. She is seeing success and fulfillment through the creative choices she makes. Choices are before us all the time. What will you choose to grow and be? The smallest choice can make the biggest wave. This entry was posted in inspiration, Uncategorized and tagged ART, Arts, brain, breathe, choice, choose, feeling, happiness, Health, hearing, influence, inner, inspiration, Journals, learn, Learning, lesson, life, listening, Music, process, self-help, teach, wave on April 17, 2014 by Jen Lang. Intention is a powerful word. It’s a word of strength, focus, and meaning. If you are intent on doing something, it has your full attention. 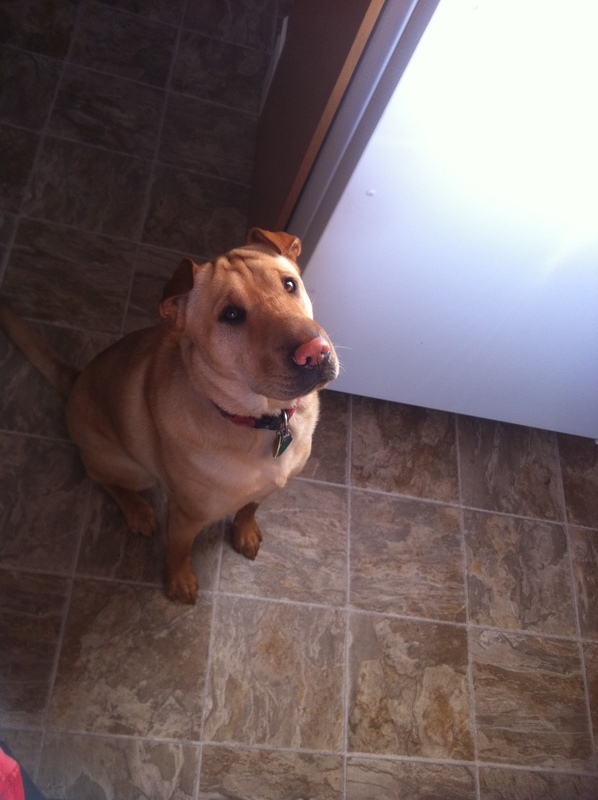 Lola’s intention is focused on the piece of bacon in my hand. For me this year, intention is a word that is lending focus to my year, and to my music. I am preparing to perform an opera on May 24th. I started working and practicing my score in January and for the first six weeks or so, I was intent on my schedule of practice. Then a long-time friend suddenly died after being hit by a car one morning. And my intention on music and practice was shifted. I would even say it was re-focused (out of necessity) for about a month to six weeks. My body and my soul were intent on the necessary healing. Six weeks doesn’t seem long, but when I was in it, it seemed an eternity. Between mid-March and early April, I began to feel my intention for music practice return. I went back to regular Yoga practice. I created time in my calendar specifically for practice. I’m still working out an ideal balance between work, practice, health, and daily life, but I am intent on making this work. Intention is not the same as focus. I believe it comes from a deeper place. What do you think? Please feel free to share your thoughts on intention in the comments or reply area below. 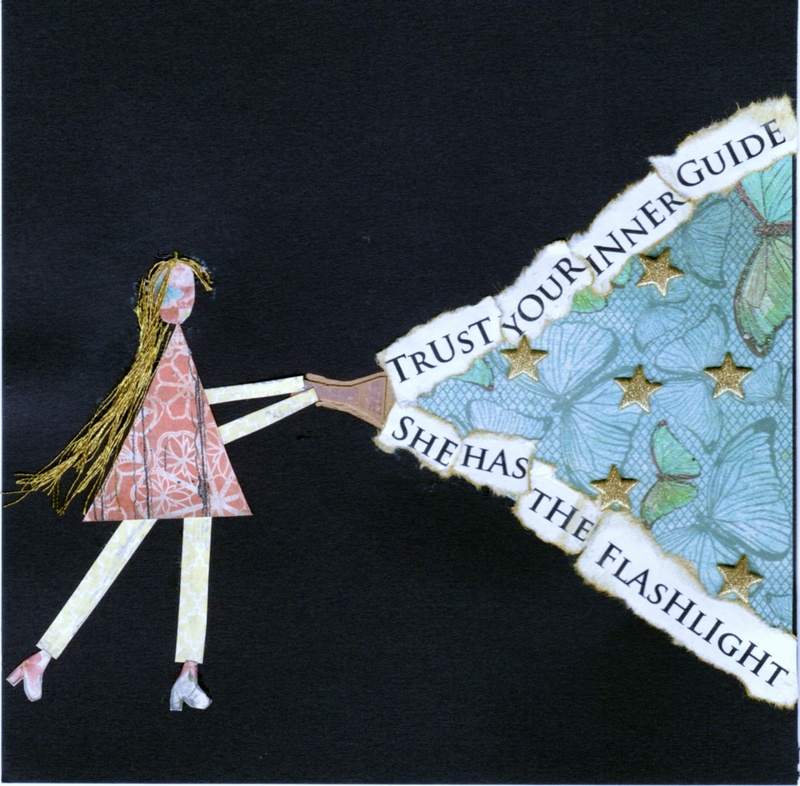 This entry was posted in inspiration, Music, Singing, Uncategorized and tagged ART, brain, breath, focus, happiness, Health, inspiration, intention, learn, Music, practice, process, teaching, three words, voice on April 11, 2014 by Jen Lang. In January I wrote about my Three Words for 2014. It has been very enlightening reviewing that post and thinking about the past thee months. Today I’ll review my three words very generally, then over the next three weeks, I’ll take a closer look at each of the words on their own. My three words were Intention, Choice, and Consistency. Each of those words are informing my life in very different ways so far this year. Intentions are related to habits. If you are intent on beginning a new habit, then it will form more quickly and more easily than if you don’t have that intention. I am still working on building my intentions for my personal singing practice habits. Sometimes life (or death) just happens and your intentions are skewered for a while. Choice – we always have a choice of what action (or inaction) we will take. In my case, every weekday when I get home from my morning job, I choose to eat a square or two of chocolate and read for pleasure for about 15 minutes. I choose to get up 20 minutes earlier than last year so I can spend time writing and starting my day. Consistency is something that can be harder to maintain. I’d like to say I’m consistent in my writing habits, but the truth is, I write (on average) three mornings a week. I want to be more consistent with my personal singing practice, but I need to adjust my choices to make that happen. I want to draw your attention to a phrase from my original post Three Words for 2014 that has grabbed readers’ attention. In reviewing this phrase, I am struck by how true it is. My choices lead to consistency in my intentions. My consistent intention will inform good choices. My intention will direct consistent choices. It’s this wonderful trifecta of related words that is swirling around my being and guiding me through the year. 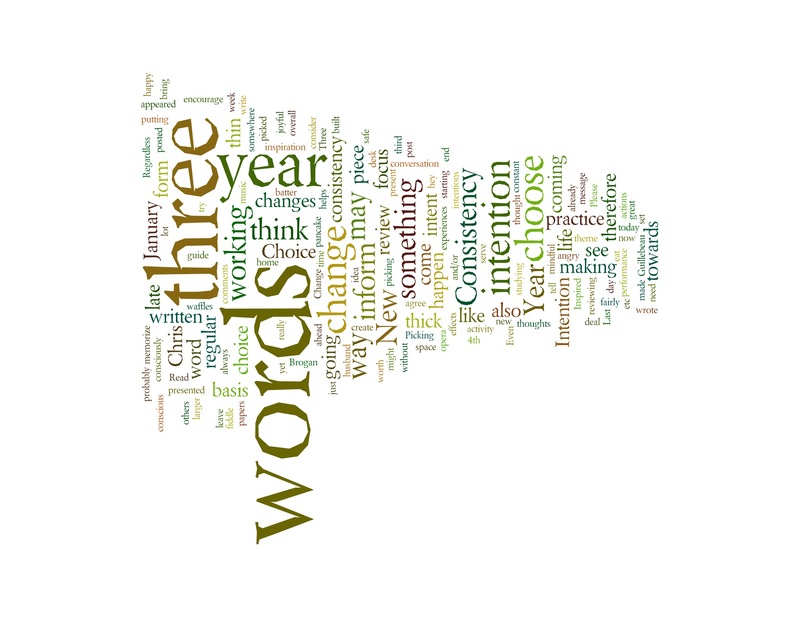 Did you set up three words for 2014? It’s not too late! Reflect on the past three months and see if any specific words make themselves known to you. Share them in the comments below – I’d love to hear from you! This entry was posted in Brain, inspiration, Music, Singing, Teaching, Uncategorized and tagged ART, brain, breath, breathe, Courses and Lessons, Education, focus, happiness, Health, inspiration, Journals, learn, Learning, listening, Music, process, Public speaking, resonance, self-help, sing, singing, Sound, teach, Vocal, voice, Voice teacher on April 4, 2014 by Jen Lang.